When I was a kid we had a pretty sweet Commodore 64 at home, with some of the best games of all time on it. However the games on that machine tended to be slow and complex, not exactly the best match for a young boy with slight (or a lot of, if you ask my mother) ADHD. Luckily for me, the NES was released in North America in October of 1985, and my mother bought one for me in 1989. I was thus ready to play simple, action packed games! REJOICE! Both of the games I am reviewing in this article I played as a kid. In fact I played them a lot. 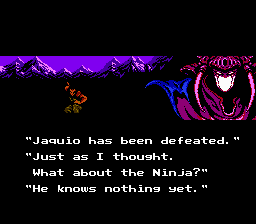 The Ninja Gaiden series stands as one of my favorite of that era, and Punch-Out!! 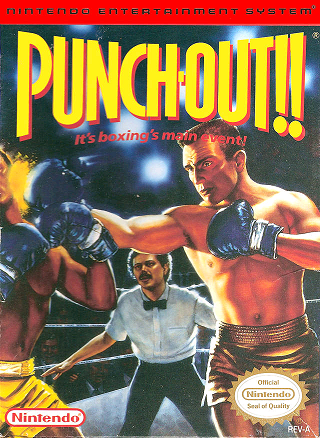 well, everybody loved Punch-Out!!. Let’s dive in shall we! 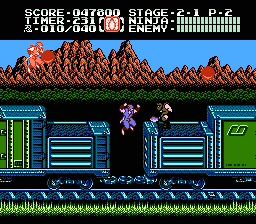 When people think of the NES Ninja Gaiden series, they mostly tend to think of the first game. It’s the one that is consistently ranked amongst the hardest games of all time. However, at the time it felt to me like the second game was the more popular of the two. It’s the one I played first at my friend’s place, bought first and potentially played the most of the three. I think that a big part of its popularity was that it was just plain easier than its predecessor, and also than its successor (people forget, but Ninja Gaiden III was the only game in the series to have a limited amount of continues, making it de facto the hardest of the three, really). 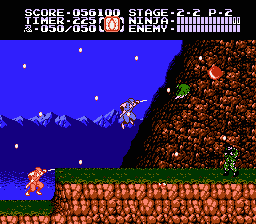 Ninja Gaiden I was an exercise in patience and pain, but II was definitely more manageable. So what do I think of it in 2015? You have to realize that games like these are relics of a bygone era. They’re very linear, short, story driven experiences with no secrets nor things to collect. That means that once you’ve finished the game, you’ve seen everything it has to offer. On the original NES these games had no way to save your progress, not even passwords, so finishing them required a lot of perseverance, or for you to just leave your NES on for days as you slowly crawled your way through. Most NES games were like that, you’d repeat the game over and over again, slowly getting better at it, going further in it, and then eventually one day you’d beat it. On the 3DS however you can save your progress anywhere you want with the save state system. It kind of breaks the game. You can save right before bosses and just reload that save until you beat it, or like I did you can just save at the beginning of every new stage so you can easily pick up where you left off. This combined with Ninja Gaiden II being the easiest in the series (but still pretty hard, especially for people not used to classic 2D platformers), made finishing the game a breeze. Feels like I barely broke a sweat. The series was also known for being one of the inventors of the cutscene, or more specifically cinematic type cutscenes. It was certainly the first game like that that I played at the time, and it was by far one of the game’s most appealing feature. It ushered into an era where I had a tendency to play video games for their storylines, rather than for their gameplay. But now, those cutscenes feel more like an historical curiosity, and are cheesy as heck. Hey, still entertaining, but nothing that will blow you away in 2015. The game still has an absolutely kickass soundtrack, however. So would I recommend it? I’m not sure. It’s kind of fun, but nothing amazing. If you played the games before and you know you love them, you could certainly spend your money in worst ways. I just bought 2 kilos of candy after all, and it cost me $20 CDN. There’s at least 2000 empty calories in there (and that’s with me being generous, probably upwards of 3000 easy), none of em good for me. The game is $5. You decide which is the better investment. Aaaah, good ol’ Punch-Out!!. Punch-Out!! always felt like a game that everybody loved, but was nobody’s favorite game. It was like old faithful, relentlessly replayable, always fun. Kind of simple but, that was the magic of it. These games were released pre-internet, so you couldn’t just jump online to find out how to beat one of the game’s many colorful characters. God, I remember struggling to find a way to beat King Hippo with my friends, we just had no idea. We struggled for weeks until someone found out how to do it. The same thing applied for most of the other characters as well, although Hippo truly was special as there is no skill to it, the minute you figure out how to beat him, he’s done. Today, the game is still a lot of fun. Punch-Out!! is basically a puzzle game, or at least it is for the first ¾’s of the game. Although a lot of the characters can be beat without any special strategy, a lot of them can either be beaten easily if you do something specific to them, or cannot be beaten at all unless you know the special trick. It makes for a lot of fun trial and error type gameplay, trying to figure the characters out. However, once you reach the last quarter of the game its gameplay changes drastically. No longer is it about figuring out how to beat your opponent, now it’s more about pure reflexes. When Super Macho man revs up his tornado punch, you not only have to figure out version of his punch is coming, but you also gotta evade it. And evasion is pure skill. And that last part is all reflexes. 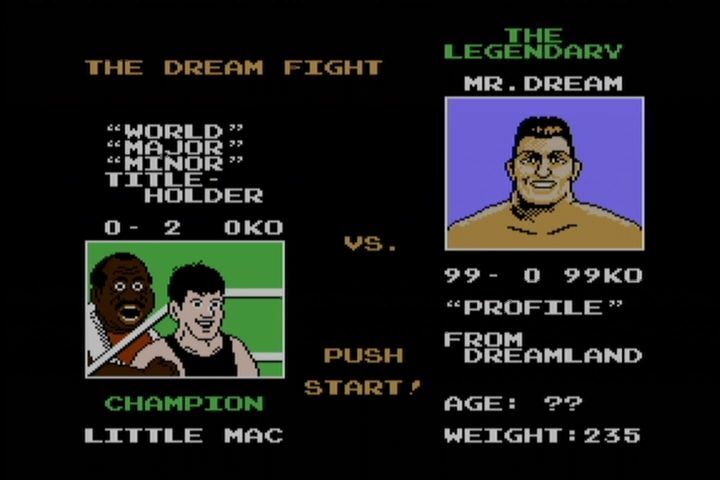 Beating Mr. Dream (in the original version of the game it was Mike Tyson, most likely one of the reasons for the game’s legendary appeal in the 80 and 90’s) is near impossible without abusing the save state system. He’s constantly changing the timing of his punches, royally screwing up your senses. Thus, again like in Ninja Gaiden II, abuse of the save-system is kind of a problem however I would say that it is less so here. Ain’t nobody wanna mess with a password system in 2015! And some of these characters are genuinely hard. 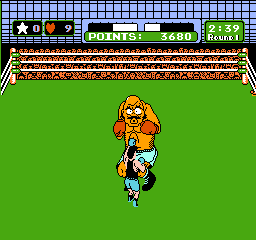 Mr. Dream/Mike Tyson is generally seen as being one of the, if not THE hardest boss in gaming history. So, abuse away! The graphics look great. The game has some of the most colorful characters ever created in video games, and it’s hard to forget their facial expressions when they get punched. Those big bulging eyes have so much personality in them! It just makes you want to punch them again and again, which is exactly what you should be doing, so it all works out just fine! It doesn’t have many tunes, but the ones it has are some of the most iconic themes in video game history. All four of em. I feel like Punch-Out!! 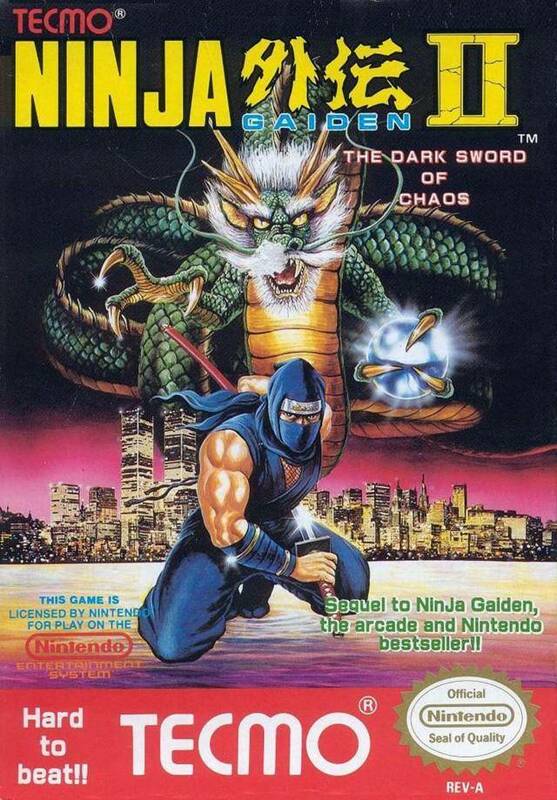 stands the test of time better than Ninja Gaiden II does. It’s very fun, charming, easy to pick up and play, with a good mix of reflex based and puzzle based gameplay. For $5 I definitely recommend it. One thing I have to mention, both games were kind of awkward to play on the original 3DS XL. You have to use the d-pad for movement, which means that your hand tends to be much lower than usual, and doesn’t support the weight of the console as well as it would if it was holding it higher. It’s a minor inconvenience, but it has to be said. Have fun!